Brentford and Isleworth is one of the two Quaker burial grounds in the London area still open for burials. It is available for Quakers and others closely associated with Friends. For all enquiries please contact Bessie White via this link or ring 020 8560 5887. Quaker Meeting Houses often had their own burial grounds as Quakers were not permitted to be buried in Church of England graveyards. 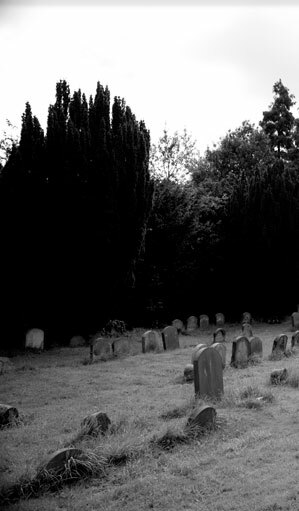 The very earliest interments at Brentford and Isleworth were in our north burial ground and have no head stones. A single stone and a plaque on the wall refers to these interments. The southern burial ground was given to the Meeting by Sarah Angell in 1824. The centre of this area contains the remains of Friends buried originally in the Friends Burial Ground at Long Acre between 1675 and 1757. They had to be moved in 1892 because of what at the time were called ‘excavations’. Graves were marked with both a headstone and a footstone, but these latter have been removed to make mowing easier. As in all Quaker burial grounds, the stones are low and uniform, reflecting the Quaker philosophy of equality.